Frank Smith is internationally acclaimed as an essential contributor to research on the nature of reading and as an originator of the modern psycholinguistic approach to reading instruction. In his publications his aim has always been to support teachers, to encourage them to make teaching decisions based on knowledge and understanding, to analyze what their students are trying to do and why what the students are doing doesn’t always correspond with what they are expected to do. 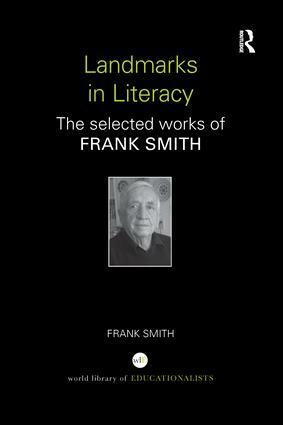 Now the major topics addressed in his work are available in one volume, Landmarks in Literacy, a thoughtfully crafted selection of 16 of his key writings. In the World Library of Educationalists, international scholars themselves compile career-long collections of what they judge to be their finest works so the world can read them in a single manageable volume. Readers thus are able to follow the themes and strands of their work and see their contribution to the development of a field, as well as the development of the field itself. Frank Smith holds a Harvard Ph.D. in Cognitive Psychology. He has written over 20 books on such topics as language, reading, writing, thinking and comprehension. He has held positions as professor at the Ontario Institute for Studies in Education, Professor of Language in Education at the University of Victoria, British Columbia, and Professor and Department-head of Applied English Language Studies at the University of the Witwatersrand, South Africa. He was featured by the BBC in a program titled "How Do You Read?" and was a featured speaker in the Canadian Broadcasting Corporation's Ideas program on language. His most recent prize was awarded by the National Council of Teachers of English "for his transforming influence and lasting intellectual contribution to the English profession." He is the first Canadian to receive this prestigious award. The World Library of Educationalists celebrates the important contributions to education made by leading experts in their individual fields of study. Each scholar has compiled a career-long collection of what they consider to be their finest pieces: extracts from books, journals, articles, major theoretical and practical contributions, and salient research findings. The distinguished careers of the selected experts span at least two decades and include Richard Aldrich, Stephen J. Ball, Elliot W. Eisner, John Elliott, Howard Gardner, John Gilbert, Ivor F. Goodson, David Hargreaves, David Labaree and E.C. Wragg. Each book in the series features a specially written introduction by the contributor giving an overview of their career, contextualizing their selection within the development of the field, and showing how their own thinking developed over time.